If you’re a parent in Arcadia or anywhere else in southern California, it’s natural to think that when school’s out for the summer you can let down your guard where head lice are concerned. With summer vacation coming up soon, it’s important for you to know that there’s really no escape – lice love summer break too! While your children won’t be in a crowded classroom for several weeks, there are other activities that leave them susceptible to those pesky critters. Maybe your kids will be attending summer camp, or you intend to spend lots of time at the beach. 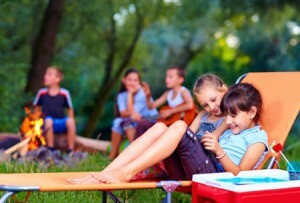 Sharing beach towels, kids in close contact at camp, slumber parties and sleepovers, even participating in softball or another summer sport; there are countless activities during summer that involve lots of kids. This is the environment head lice love! Heat, humidity, and no teachers around to take a look at the kids’ heads when something is “suspect” – it’s a great vacation for bugs and their eggs! Additionally, this is the ideal time for incubation prior to an infestation, as it generally takes about a month to six weeks for the little buggers to give away their presence through itching and other symptoms. We want you and your kids to have a great summer break, but be sure to check your children’s heads, stress that they should not touch heads or share hair accessories or combs/brushes, and seek safe head lice treatment immediately if your child develops this condition despite all your efforts.